I tried to find a black and white damask wallpaper to put on the back of the play cupboard, but it has to be special ordered, which, no thanks. I'll try to find some on these internets instead. John especially loves it, of course, when I cast aside any concern for the growing heap of unfolded laundry in our bedroom and instead buy supplies to make doors for a kitchen cupboard that Pinga won't even be interested in for years yet. Not that the laundry is solely my stewardship or anything, but we both get frustrated at just how poorly we manage our time and resources. I have a santoku knife now! I loves it, precious. I haven't used it to cut potatoes yet, but it rocked on the eggplant tonight. I love knives, inordinately so. I want a nice, serrated bread/tomato knife now, and then maybe I'll be done with the conspicuous knife consumption. I blame it on growing up in a house that had not a single knife sharper than a trowel, and now I'm trying to remedy that glaring gap in my practical development as a hausfrau. I'm re-reading Animal, Vegetable, Miracle, because I've run out of books and haven't had time to run to the library recently, because it's Family Reunion Season. I love that book so much. It reminded me that I have to retrench, you guys. I don't know how to fit in all the things I need to be doing, but next year cannot be like this. I think having only three pregnant mamas running around is going to help a little, but mainly I just need to get off my tuchus. As they say, when you don't know what to do, do the work in front of you. I weeded my front flower garden this week, and it looks great. The wicked morning glory has been temporarily beaten back. There's a big gap where something died--I can't even remember what--and the Oregon Grape, Diablo Ninebark and Spiraea are all up in each others' business, so I'm going to have to transplant at least one of them, but mostly it looks beautiful. The Peaches n' Cream daylily is exploding with blossoms right now. Perennials are awesome. I love having a garden that just does its thing and all I have to do is maintenance, because heaven knows I have a hard enough time doing that. John and I are really good at starting projects, but the day-to-day grind is just a little beyond us. I got it from Urban Outfitters for $22, it arrived this morning, and I have been using it all day. Who needs a stool? YOU need a stool. STOP THINKING GROSS BOY THOUGHTS ALL OF YOU. yet who would have thought the Harmons to have had so much cheese in him? Saturday night we were driving home and were able to get to Harmons before midnight, and I went in to see this crazy new cheese section that they have been advertising all over the place. It's really something. They have an array of cheeses you wouldn't believe from a grocery store. And they had Humboldt Fog, woohoo, and I also got some Taleggio and Mimolette and then some Parrano because I am a sucker for those little flavor crystals. Also they had figs in surprisingly good condition. So yesterday we had a fruity and cheesy lunch. I'm the only one willing to eat much of the Humboldt Fog (It tastes a lot like a goat in the center, but the edge is soft and runny, and much milder. Sort of Brie-like, but yummier. The rind reminds me of watercress. ), but all the other cheeses went over well. The kids especially like the Taleggio. Probably because it tastes like what those Laughing Cow cheeses are trying to be. Soft, buttery and mild. Very easy for kids to handle. I wish we had had some mascarpone to go with the figs, but I guess you can't have everything at once. I totally lifted that post heading from the Onion, but hopefully they won't sue. 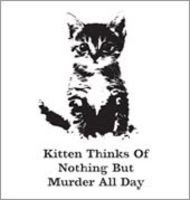 Kitten is thinking of nothing but murder because she has begun painting the Ghetto Bathroom. We live in an old house, as longtime readers and acquaintances know, and there are pipes all over the ceilings in the basement. So just try cutting in with that crazy going on, I dare you. I loathe cutting in. But it's all primed now, at least as well as I can get it, and tomorrow I'll paint. I've sewed and cut and beaded and tucked, but my silk purse still looks suspiciously like a sow's ear. However, it will be a functioning bathroom, and a pretty nice one at that, as long as one doesn't look at the walls and ceiling too closely. What lovely words. I enjoy singing them. This morning I was listening to the end of the Motab broadcast, and they did a rocking job on "Come Thou Fount of Every Blessing," a song which took me years to hear without crying. When I was in the Mormon Youth Chorus we sang it with the full orchestra one Sunday, and I couldn't get through it. It gets so huge at the end, and it is such an American hymn--Mack Wilberg's arrangement of it, especially. It's so powerful. When I was making John rewatch the end of the broadcast with me I said, "Who says Americans don't have a culture?" You can hear it in our music. We may be brash, bombastic and overbearing, but we can also be generous, noble and courageous. What a blessing it is to live in this heaven-rescued land. What our floor has looked like for a year or more. After sanding the mud room for a frillion years, it looked pretty okay. Stupid tarpaper. Here is the floor all primed. After the coat of Country Dairy floor paint, and you're all, "Meh." But wait . . . I am serious. Look at it from this angle! Also I painted the mud room, because it looked super janky next to the pretty new floor. It required much money and paint and measuring and tape and WORK, but I am so, so happy that it is done. It looks so good, I want to paint the rest of my floors. The other thing we've done this week is take a bunch of goats to the auction, where they will be bought by people most likely wanting to eat them or have pets of some sort. Good luck with Tilde, y'all, because she is not nice. We kept Tenacious D and Edna's boy, and both of Catwoman's babies, so they can take care of milking her when necessary. I can't tell you how nice it is not to hear Dingus Squatford yelling at us all day.